'It's like a game of chess. You win some, you lose some,' Shatrughan Sinha, the BJP's Lok Sabha MP from Patna Saheb, tells Subhash K Jha. While the Bharatiya Janata Party headed towards Bihar for an alliance with Nitish Kumar, Shatrughan Sinha -- the BJP's self-proclaimed most loyal soldier -- headed for London to attend a Bhojpuri film awards function. Sinha, who likes to speak his mind, was unusually cautious about the political developments in his home state. "It's too early to predict, let alone say, which way this new alliance will go," the BJP"s Lok Sabha MP from Patna Saheb said. "I would always want the best for Bihar. And I am sure Nitish Kumarji wants the same," Sinha said, speaking on his way to the airport. 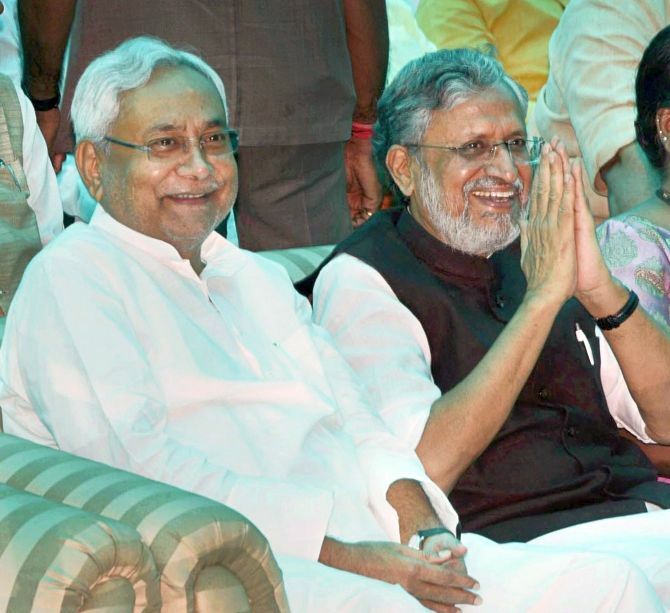 "As a loyal soldier of the BJP," he added, "I am most happy to see Nitishji take Narendra Modiji's hand of friendship." Wasn't Nitish Kumar worried about the secular credentials of the BJP, a party that the Bihar chief minister till recently claimed upheld non-secular values? "Whatever works for the peace, prosperity and progress of Bihar works for me," Sinha said. "If by forming a new alliance with us, Nitishji is better able to implement developmental ideas in Bihar I am all for it." "However it's too early to say which way the new alliance will go. There will be rapid developments in the politics of Bihar in the coming days and weeks. This much I can tell you." "At the end of the day, it is politics. It's like a game of chess," Sinha said. "You win some, you lose some." "I refuse to declare Laluji (Rashtriya Janata Dal leader Lalu Yadav) guilty in the multiple scams until proven so by the courts. We can't write him off yet." Even though he has reportedly been sidelined by Modi and BJP President Amit Shah, Sinha ends the conversation with praise for the man he calls the BJP's "action hero." "He set aside all his work and attended the function for our former President Abdul Kalam in Tamil Nadu," Sinha said, speaking of Prime Minister Modi. "I don't think there is a more secular leader in India today."